Grew up in his father's bookstore in Wheaton and went on to found the literary giant Barnes & Noble. From humble beginnings as a Minnesota farmboy, Sears moved to the big city and came up with the oh-so-clever notion to provide quality goods for a fair price. It worked. A department store magnate wise enough to declare "Give the lady what she wants." He gave even more by bequeathing $8 million to start the Field Museum. He started the first mail-order business in the world but is even more affectionately remembered for having the foresight and persistence to see the value in a well-groomed lakefront for Chicago. The single pharmacy that he opened in 1901 grew into a $25 billion corporation within a century, thanks to great ideas like adding a lunch counter and soda fountain to the neighborhood drug store. When Ol' Blue Eyes sang "State Street, that great street," he was merely acknowledging a fact: downtown Chicago was then, as now, the quintessential American shopping district. In fact, by the time Sinatra crooned those words, Chicago was well into its second century as a retail mecca. 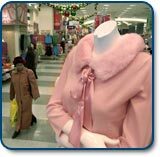 Consider this: Chicago gave the world Sears, Montgomery Ward, Walgreens, and Marshall Field's -names that have become so ensconced in the collective consciousness of consumers as to actually define what it means to shop. Today, much of the ground broken by these pioneers is again ripe with the fruits of commerce. The Loop, an area of downtown Chicago so designated for the elevated trains that neatly circle it, is home to a dizzying array of stores and merchandise. Interspersed among the grand old department stores are specialty boutiques that ignite the imaginations of visitors and long-time residents alike. Just a bit closer to the lake that gives it its name, Michigan Avenue is a modern, luxurious shopper's delight. 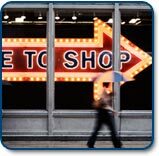 The stores along this "Magnificent Mile" are instantly recognizable to any visitor. The center city, however, does not hold a monopoly on retail trade. In fact, traveling outward from the Loop, virtually every neighborhood has distinct, and often unique shopping centers. The ubiquitous storefronts are inevitably most concentrated at the junctures of main transportation thoroughfares and rapid transit stations. 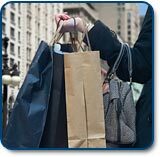 Evanston, Oak Park, Park Forest, Hillside and Skokie all boast substantially developed retail centers. The mall in Schaumburg takes retail to Brobdingnagian proportions with over 2 million square feet of retail space. The suburbs of Chicagoland have experienced significant growth in population, and are well-serviced by a new generation of retail plazas and big box stores. But from the mouth of the Chicago River to the farthest flung suburb, one thing is still clear - in Chicago, it is always "time to shop."